Review: 2013-08-17, good fight between Takashi Miura and Sergio Thompson: it gets three stars. Takashi Miura (25-2-2, 19 KOs) entered as the No.3 super featherweight in the world while Sergio ‘Yeyo’ Thompson (27-2-0, 25 KOs=86%) entered as the No.15. 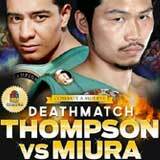 Miura vs Thompson is valid for the WBC super featherweight title (Miura’s first defense). Watch the video!